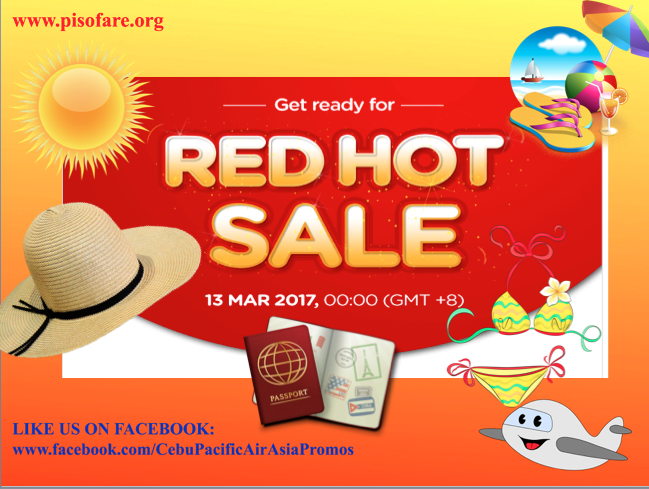 Promo Tickets: Here's something new from AirAsia Philippines as they launch their latest #RedHotSale starting March 13, 2017. If you are still expecting Cebu Pacific Piso Fare, forget about it and just focus with what AirAsia can offer to you. As soon as the clock strikes 12:01 am on monday, you can now search for plane fares on promo! There you go, you have 7 days to book a plane ticket via AirAsia Philippines. For those AirAsia BIG Members, you have the privilege to get a 24-hours priority access on Sunday, March 12, 2017. That's a day before the launching of #RedHotSale. Just make sure you are logged in to your account. Not yet a member? Sign up as an AirAsia BIG Member now! Again, those coming from Clark, Cebu and Manila may enjoy these latest offerings from AirAsia Philippines. Take a look of the travel dates too! Plan your travels ahead of time. Preparing everything before you go on trip is the key to a successful and enjoyable vacation. Make sure the itineraries are all set and you've got all travel essentials with you. If you can travel light, the better. Well, there are no Piso Fares yet from Cebu Pacific Piso Fare as they have already released a one-day promo of it last month. So the only option to avail any affordable fares with with AirAsia Philippines. So be ready with your computers or mobile phones. And kindly check your internet connection too so you won't have any problems with booking on the day itself. Should you like to visit Cebu and explore its wonders and beautiful beaches and a lot of water activities like diving, swimming, canyoning, island hopping and etc. We can highly recommend you to visit Cheap Vacation Deals Facebook page for available promos on group tours. For as low as Php 1,900 per head (in a group of 12), you can now enjoy a day tour on whale shark watching in Oslob, Cebu. How is that? If you prefer to visit Kawasan Falls after the Whale Shark Watching in Oslob, Cebu, you will only need Php 3,500 per head (in a group of 4) to enjoy this package. It's one of the cheapest or most affordable travel package you can have with our partner travel agency. Of course, don't forget to book your plane tickets and avail the latest promo tickets via AirAsia Philippines. What is the promo code?? Promo Tickets at Php 599!